The Band was founded in September �, after Matthias (drums) and Sathonys (guitars) put adverts in various music magazines to find suitable musicians to join them. Shortly after, they got hold of Marko (bass) and Vlad (vocals and keyboards). 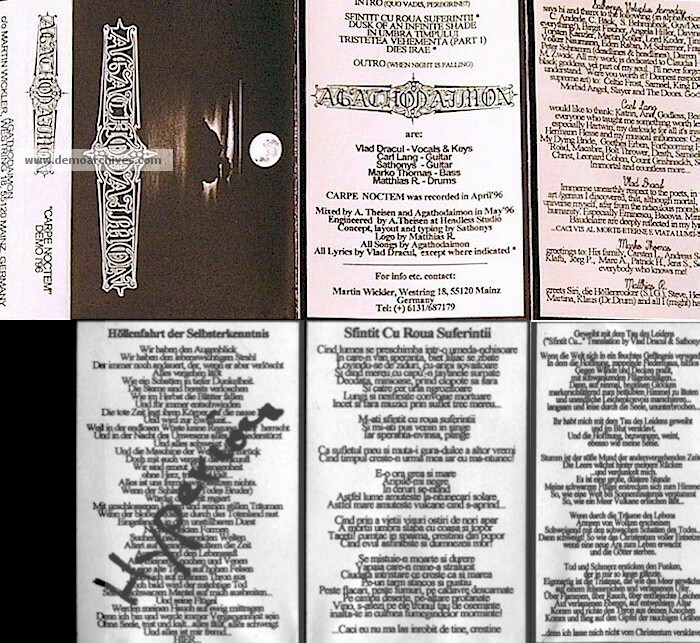 Two months later, a second guitarist (Hyperion) was added to this line-up, and in this constellation, the band recorded its first demo CARPE NOCTEM in April �, which received great reviews in German major press like Rock Hard or Metal Hammer, but also in the worldwide underground. 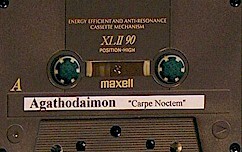 Many gigs with bands such as Desaster, Impending Doom, Ancient Ceremony and others took place, and even a little tour as support for Ablaze My Sorrow and Beseech was absolved, and after Century Media were aware of their live qualities, Agathodaimon was offered financial help to record their second demo, which the band at this moment couldn磘 afford to record. This second demo was called NEAR DARK and was recorded in march �. Again, Century Media were impressed, but as the negotiations took a long time, the band offered this demo for sale, making it one of the most successful demos ever, selling more than 2500 copies so far. 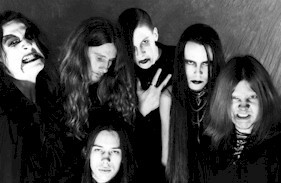 Meanwhile, other labels showed their interest due to enthusiastic reviews, and so the band also considered the offers of companies such as Listenable, Head Not Found, Last Episode, Merciless and others, but in the end, they decided to sign to Nuclear Blast as they simply made the best offer, concerning promotion, support and marketing.